One simple drink that I like is the Adirondack Blossom. It is made with a jigger (2 fl-oz. by pre-prohibition standards) of old tom gin shaken with a pony (1 fl-oz. by pre-prohibition standards) of freshly pressed navel or Valencia orange juice and plenty of method ice. It should be finely-strained into a chilled 5 ½ fl-oz. glass goblet. An orange quarter-wheel does nicely as the garniture. The drink was served in the Waldorf Bar and recorded in its notebook sometime between 1893 and 1919. One variation of the Adirondack Blossom that I like in warm weather is a drink I call the Plattsburgh Blossom. I make it on the same foundation as the Adirondack Blossom with tom gin, but with fresh blood orange juice. I like to garnish the drink with a skewered marasca cherry. The drink I have described represents enough of a variation to require its own unique name, in my opinion. So, thinking of the Adirondack Blossom and ‘blood’ led me to the Battle of Plattsburgh in 1814. Plattsburgh is in the northern part of the state of New York. It is located on the Adirondack coast of Lake Champlain. In the late summer of 1814, the British sought to seize Plattsburgh by land and water from across the Canadian border. The Americans were victorious in the bloody battle, capturing the British flagship and watching the British army retreat back into Canada. The war of 1812 ended shortly thereafter with the Treaty of Ghent. So, try a Plattsburgh Blossom sometime in the coming summer campaigning season – and recall the simpler times when fighting for your country meant defending it at home. The Plattsburgh Punch – make as above, but with only ½ fl-oz. of the blood orange juice, and add ½ fl-oz. freshly-pressed lemon juice and a dessertspoon (two teaspoons) of superfine sugar. Straining this adaptation into a 5 ½ fl-oz. glass sour goblet after shaking would be most correct. 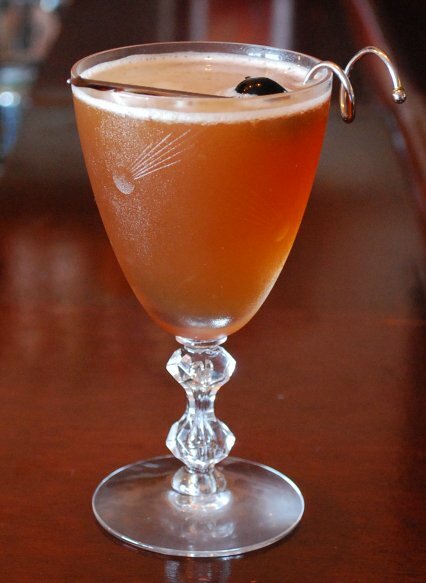 The Plattsburgh Cocktail – make as above, but with only a barspoon of the blood orange juice, and add 2 dashes of orange additive bitters and an optional teaspoon of superfine sugar (if the tom gin does not sufficiently sweeten the drink for you by itself). This should be stirred with method ice (instead of shaken) and strained into a 4 ½ fl-oz. glass cocktail goblet.